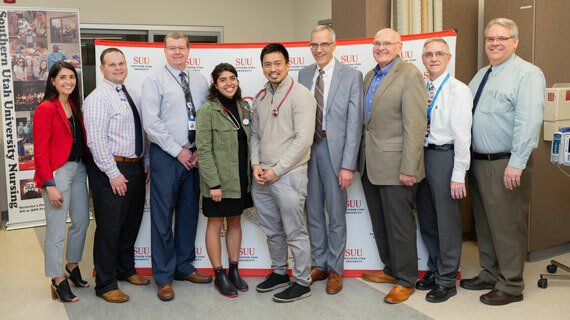 This week, Intermountain Healthcare Cedar City Hospital presented a check to Southern Utah University for $60,000 in scholarships for minority students, as part of their Diversity in Nursing Scholarship program. 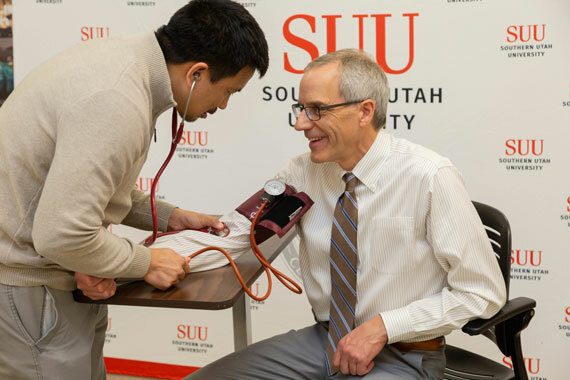 These scholarships, of up to $3,000 per semester per student, will be awarded to SUU nursing students enrolled full-time, and can be used to cover the cost of tuition, books, fees, and any other barriers including childcare or transportation, that may prevent culturally-diverse students from enrolling or continuing their education. President Scott L Wyatt of SUU says, “We are appreciative of this generous donation and what it does for our nursing students. It is important to SUU that all types of students are successful together and that we have opportunities for students of all socio-economic, racial and ethnic backgrounds." One student that received this scholarship is Vishant Thapa, pictured taking President Wyatt’s blood pressure. He was born in Siliguri, India, and worked in the laboratory at Cedar City Hospital for seven years before he decided to change his profession to nursing. “I am very grateful for this scholarship, it has been very important and meaningful to me and my family,” says Thapa. Intermountain Healthcare Cedar City Hospital donated $100,000 to the Diversity in Nursing Scholarship program at SUU in April of 2016. This latest donation of $60,000 shows their ongoing commitment to this program.